The terrifying, true story, of a young child's encounter with the Prince of Hell. The story you are about to read is true. It is based on real events – my personal experiences since winning eBay’s most infamous haunted doll in an auction in June of 2004, as well as what has happened to those who have had encounters with the doll. I’ve also adapted the texts and Facebook messages of those claiming to have been affected by the doll. Many of the names have been changed to protect the privacy of those involved. A number of people have stated having had adverse reactions simply by looking at a picture of the doll, reading my blog, or posts I’ve written on Facebook. Not everyone has, of course, but I feel I must warn you in advance that I cannot be held responsible if you are affected physically, mentally, or emotionally from reading this book. 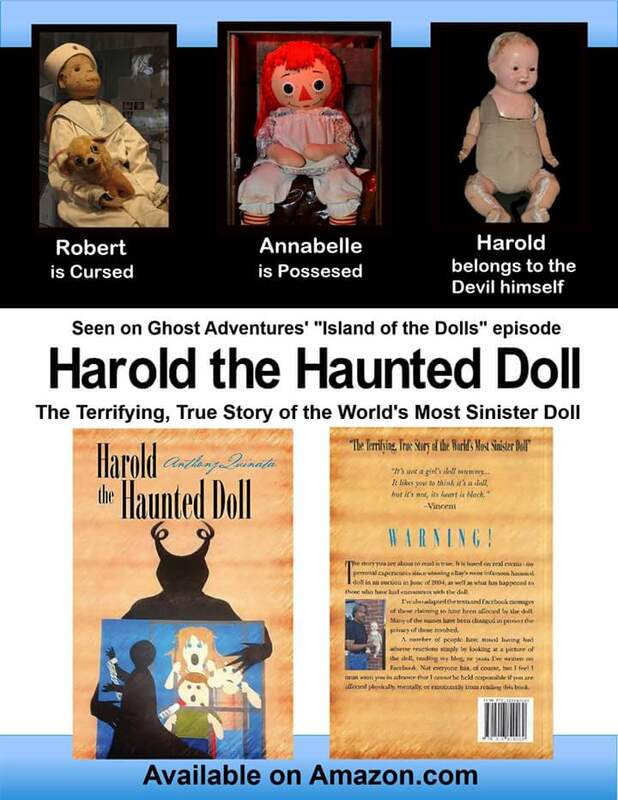 If you have ever researched or looked into haunted dolls on the web, chances are you have come across Haunted Harold. With that being said, Harold has an extensive history. The doll was manufactured around the turn of the century and is made of composite particles, plaster and water. The manufacturer is unknown at this time. You can tell the doll has been, and forgive my pun, through hell and back. The doll has been owned by people around the world. All of the previous owners have reported strange occurrences, such as voices, slight movement and changes in facial expression. Headaches, migraines, back pain and unexplained injuries have also been reported while in its presence. The doll has also been blamed for the death of two people. The doll being responsible for these deaths is still up to speculation, the truth may never be known…. Harold’s current owner, Anthony Quinata, bought the doll on eBay in 2004. After experiencing some paranormal activity, Anthony put the doll in storage from 2005-2013. We were contacted by Anthony to provide an understanding of what type of entity inhabits the doll. After an initial interview we decided to go to an undisclosed location and perform an EVP/Ovilus session. During the investigation, the Ovilus had numerous hits on the words “worry” and “guilt.” Our EVP picked up on many different voices accompanied by screaming and laughter. While reviewing a short EVP session we conducted on our first meeting with Harold, our lead investigator became ill. Plagued with a migraine headache, severe lower back pain, and the feeling of being disorientated, the investigator had reason to believe he was being attacked. After our lead recovered, it was decided to delay the release of the evidence that was collected on Harold. It was also determined not to further pursue any other investigations with Harold and Anthony at this time. My name is “Jane.” I live in Australia with my husband and two sons, the oldest of whom, “Vincent,” is moderate to severely autistic. I was not, and still am not, the slightest bit interested in anything having to do with the paranormal. I was interested in learning how to sew cloth toys, so I went onto YouTube to find a tutorial on how to do just that. God knows how I got on to the weird side of YouTube, but Annabelle was where I ended. I had never even heard of her before that but felt compelled to click and watch a short story on her. Then, at the side, I saw Harold! He sure grabs your attention and draws you in. I think it was almost a sense of pity…, but also a feeling of wanting to know more. A need to know his story. He’s not a kind of thing you look at once on a page and move on. He makes you stop and look twice. I clicked on the video clip, but to be honest I didn’t really listen to it too much (it was one with just a still picture of Harold). After that, I’m not sure… I think the phone rang or [my husband] came home, but I forgot about it and carried on with the day. Come to think of it, I don’t think my computer has worked properly since. It would have been a few hours after I first seen the clip that Vincent saw it as well. I don’t really remember how we both got to being back in front of the screen. I think he wanted to play reading eggs or something, but I know his reaction was instant. He just stopped in his tracks, looked, did a double take, and looked again, which is unusual for him with his autism. Then he became instantly upset. I didn’t know it at the time, but that moment was the beginning of what would be a roller coaster of events that would make my family’s life a living hell. It was like watching a programme on the television. As Anthony likes to say, “A real life nightmare,” only you’re awake. People may not believe, or think it’s real, but until it consumes you, and becomes your life, you have no idea. I think, this experience with the doll, it’s made not just me but all of us [in my family] that little more aware. There is a lot more to this world than we know and understand. I’m still trying to get my head around what happened. It all feels so surreal. Nothing in our lives will ever be the same or taken for granted. Yeah, I still keep looking at my two beautiful boys, hugging them that little bit tighter! The Book “Haunted Harold” Does Not Want You to Read! The Last Two Shows About Harold the Doll? I was Wrong about Harold the Doll. Part One.